With almost half of all e-cigarette sales in the UK coming from high street vape stores, it’s clear that the country has one of the most well-developed over-the-counter markets in the world – around 2000 stores in total, according to an ECigIntelligence report. 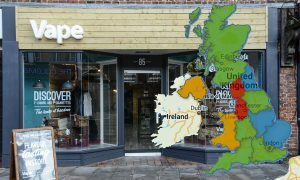 The highest concentration of vape stores in the UK can be found in the northwest of England, with the majority of stores being part of a chain. The number of vape stores in the UK grew in all regions from 2016 to 2017, except for Wales and Northern Ireland, which saw no growth. By contrast, the number of stores in London doubled over the same period. The majority of vape stores in the UK belong to chains, which vary considerably in size. There are, however, a significant number of independent stores as well. Rather than showing an even spread across the country, each of the three biggest vape store chains in the UK dominates in a different geographical area.